Carbon fibre reinforcement used to carry out in-situ repair of heavily loaded fractured timber beam. 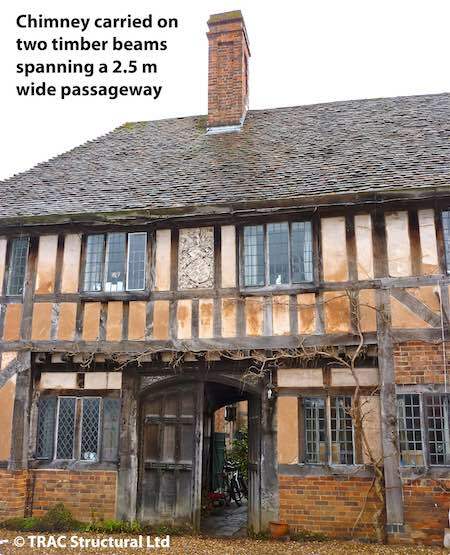 The 1.4 meter long x 1.1 meter wide chimney stack (estimated weight 6,500 kgs) was wholly supported by two timber beams spanning a passageway 2.50 meters wide. 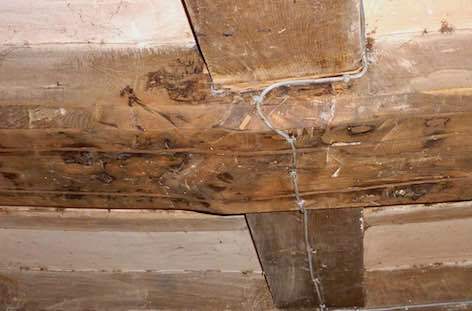 Both 350 mm wide x 240 mm deep supporting oak beams had bowed downwards and the front beam had failed resulting in major fracturing at a knot. 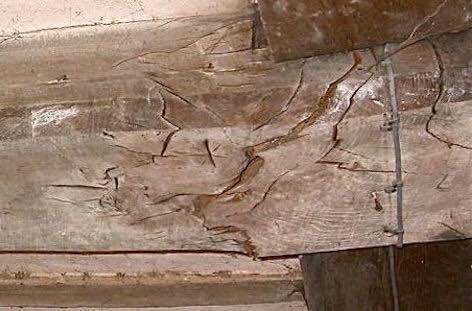 The difficulty faced by the client and TRAC Structural Ltd was to sympathetically repair and reinforce the timber beam with a minimum of intervention and with minimal residual visual impact and without disturbing the bearings and soffits. It was imperative to avoid a highly disruptive and expensive demolish and rebuild process. Visit site and carry out calculations to determine the necessary repair design using Carbon Fibre as the reinforcement. Regulate splits and shakes to a regular shape and size, piece in the splits and shakes with moisture matched timber fixed with Rotafix Structural Adhesive. (RSA). Drill through the pieced in timber and inject RSA to completely bond and fill any voids. Piece in around and fill half lap joint at centre of the span with RSA. Drill at 30 degrees diagonally into the underside of the beam and install 12 mm diameter Rotaflex Rods to provide initial reinforcement to the beam while further preparatory works were undertaken to cut the slots for the installation of the Carbon Fibre reinforcement. Cut 2 no. 12 mm wide slots minimum 200 mm deep into the soffit and install 2 no. lengths of Carbon Fibre reinforcement in each slot to give a lever arm of 140 mm. Fix plates, pack with timber and fill slot with Rotafix RSA. Wedge and piece in the surface of the installation slots in the underside of the beam. Great care was taken with sequencing of the works to support the beams and chimney during the repairs.